Every now and then, along comes a device you did not know you would need, like this MiFi one. That moniker is a strange portmanteau of Mobile and wi-fi, but if you think “small wireless router with 3G data”, then you will have it. 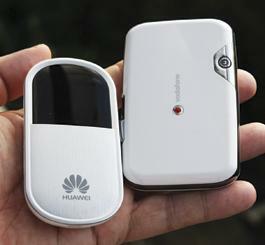 Huawei lent me an E5838 MiFi that is normally sold via telcos around the world, with a “dependent on operator” price. An internet search revealed that it would cost around $250 to buy outright and not locked to any particular provider, should you wish to get hold of one. What you get is a tiny router that connects you to the internet via a 3G UMTS connection at HSDPA (7.2Mbps) downstream and HSUPA (5.76Mbps) upstream and lets you share that with up to five users, over the 802.11b/g standards, secured with WEP, WPA and WPA2. As for 3G frequency bands, this device works on both Vodafone and Telecom, supporting 2100 and 850MHz as well as 1900MHz. Telecom users would probably find the E5838 more suited to their particular network than Vodafone customers, as there is no 900MHz 3G support. It is a smart little brushed aluminium device with four different coloured LEDs indicating what is going on with the router, and the whole thing weighs a mere 90 grams. You get the obligatory MicroSD card FLASH storage slot (no card supplied) and three buttons on the side to power on, to register wi-fi devices with WPS, and to fire up the 3G connection. That and the four multi-coloured LEDs make it simple to operate. A 3.7V, 1500mAh battery rated at 5.55Wh can keep the E5838 going for up to five hours, although I never got more than four and a half out of it in my testing. Apparently, the battery lasts up to 100 hours on standby, but I didn’t test this. The Mobile Partner software Huawei provides for the E5838 is functional, but needs polish. You get both Mac OS X and Windows versions, with SMS and phone-book features. A small web server inside the E5838 provides wireless control of the device, a firewall and other network features; again, this could be better, as phrases such as “UPnP is used to realise the intellectual interconnection” are unhelpful. Once set up with a Vodafone New Zealand SIM, the E5838 pulled data down at up to 5Mbit/s and pushed it upstream at 1Mbit/s, with latency in the 65 to 75ms range against local servers. Not bad at all, and three users were able to share the connection without trouble. In comparison, the Novatel MiFi 2532 sold by Vodafone for $399 on a plan, or $499 on its own, is a similarly featured albeit a more polished kettle of fish. It provides similar features to the E5838 such as HSUPA/HSDPA speeds, 802.11b/g wi-fi that’s encrypted, firewall, DHCP, NAT/NAPT and VPN support, in a slightly larger but lighter (81 grams) package. Importantly, the device that is called Vodafone Mobile Hotspot here provides 3G in the 900MHz spectrum, making it usable outside the main population centres as well. The Vodafone Mobile Connect software for Windows and Mac OS X is less quirky to use than Huawei’s effort, ditto the built in web interface to control the device. Performance is in the same range – on Auckland’s North Shore, 4-5Mbit/s downloads and 1Mbit/s uploads, with similar 65-75ms latency to the Chinese device and sharing the modem can be done with up to five users. Battery life out of the 3.7V 1,530mAh Li-Ion unit was a bit longer than the Huawei device, at 5.5 hours with 3G and a single wi-fi client attached. Probably due to the small size and battery power, the devices don’t have long reach – if you keep within 10 metres you’ll be able to connect to them, but beyond that signal strength drops precipitously. Why get a MiFi device then? The convenience factor is high – they’re easier to set up than ad hoc networks using your laptop, say, and the battery power means no mains electricity is required. Another draw card is that Vodafone will bundle the Novatel MiFi device with iPads once the latter are available for sale here. This means you can get a wi-fi only iPad for instance, without the added cost of a 3G one, and save some dough. Rumour has it that Vodafone intends to launch some fatter 3G data plans too once the iPad hits New Zealand shores and here’s hoping it and competitor Telecom will do just that; as per usual, cool technology such as MiFi routers is hobbled locally by steep usage charges so it would be nice to see 10GB plans or better for say $50. We can always dream.